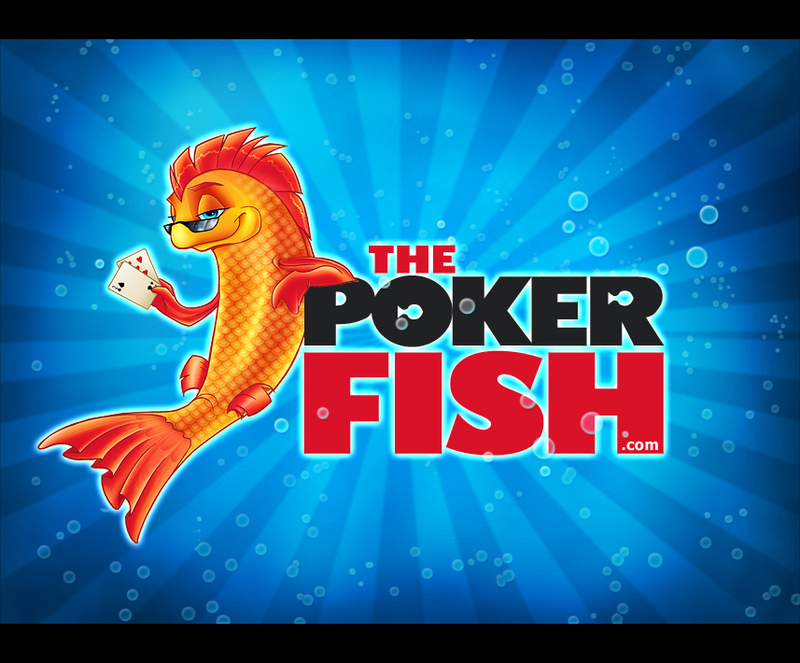 Shanky Technologies Poker Bot Support Forum | General Category | Marketplace: Profiles | Topic: KGB: SNG & MTT Profile! $10,000+ in Customer Winnings! On Sale! Only $99 0 Members and 1 Guest are viewing this topic. The best part is I have a final table and won 85$ so profile paid itself the first day. I watched it play and I'm impressed by how it performs , especially in the later stages . Another final table. Another $100! Only small stakes $5 buy-ins on William Hill but this excellent profile has already more than paid for itself. Total profit so far > $266.31 *not including rakeback & bonuses!! As a newbee, I am absolutely impressed with the work Cosmo had put into this KGB profile!!! Thank you! Thank you! and Thank you! Some of you may know me from my previous work on the Jackal profiles. They are highly successful profiles that I spent a long time perfecting. 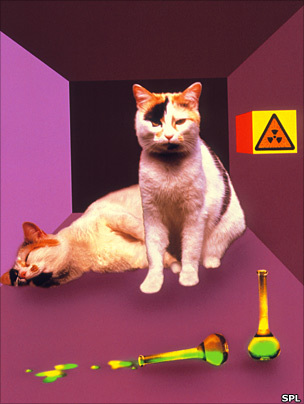 I programmed them after my own playing style: a mix of old school poker and new school poker. Well after I had gotten them about as good as they could get I began wondering how a totally "new school" style profile would do. I did a lot of research on the big poker forums that hate us as well as read through books/articles from "Elky", Phil Galfond, Jason Mercier, and some other online poker phenoms. Thus KGB was born. 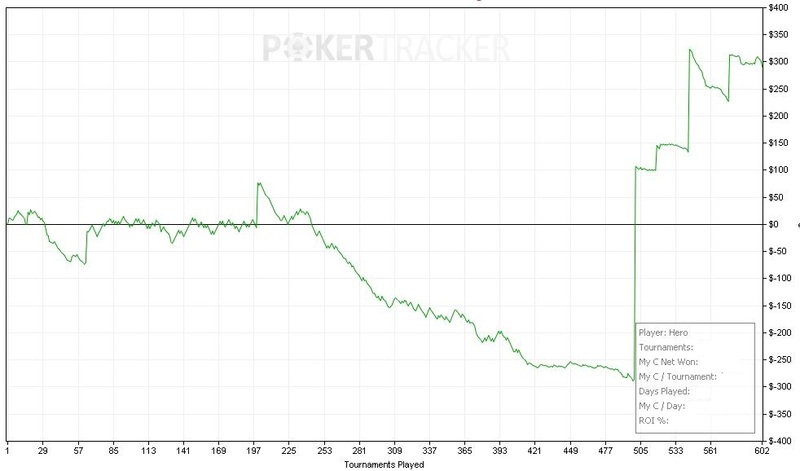 Some key features of this profile are: advanced 3 way / heads up code... in depth C-Bet, bluff, and +cEV Push code... extremely aggressive short handed code... lots of randomization... special "Negreanu" code, etc. In order to expedite the testing process I ran this profile in sngmtts. Its got over 1,100 tourneys logged in and much more to come. I utilized Balu's LAT Log analyzer to track down every single loosing line of code and correct it. 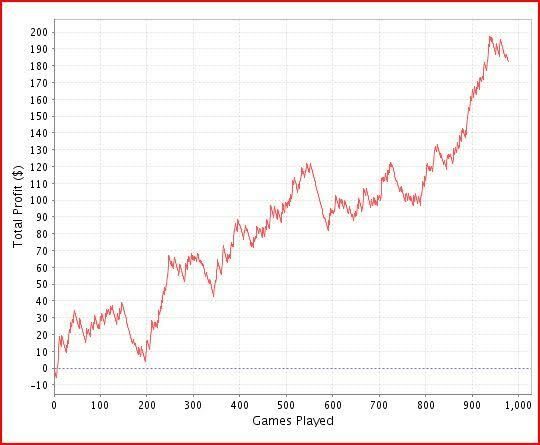 This profile will play optimal poker and the graphs below show it. This profile is special because it is an all in one profile. I have tested it in the big MTTs and SNGMTTs and it has crushed them. Sale price is set at $99 for the for the customizable txt version. Even if you only used it to grind $1 sngmtts it should pay for itself in a month. If you use it for its true potential in the large field MTTs it could pay for itself in 1 tournament... 10 times over! 4) Make sure to include a note saying what profile you are buying... and Send Away!!! Also, Please send me a separate email stating that you authorize the transaction. I cannot send the profiles until i get that email! I work from 7am-7pm (EST US), mon-fri, so i usually can't send the profile until I get home around 8pm. Just a heads up for everyone, i used my jackal profile as a skeleton for this profile. KGB plays very differently than Jackal. The biggest change i made is the advanced bluff code addition. Jackal would play very passively on the turn and river if it didn't have the goods. This wasn't bad thing, but I wanted to create a more aggressive/Viktor Blom profile. For KGB i added a lot of advanced bluff code for turn and river. That alone made it play very differently, especially late in mtts and short handed/heads up. Besides that i totally changed how it played small pocket pairs and mid pocket pairs (got away from the traditional set mining mentality. In addition to that I changed its preflop aggression with AT+, etc. 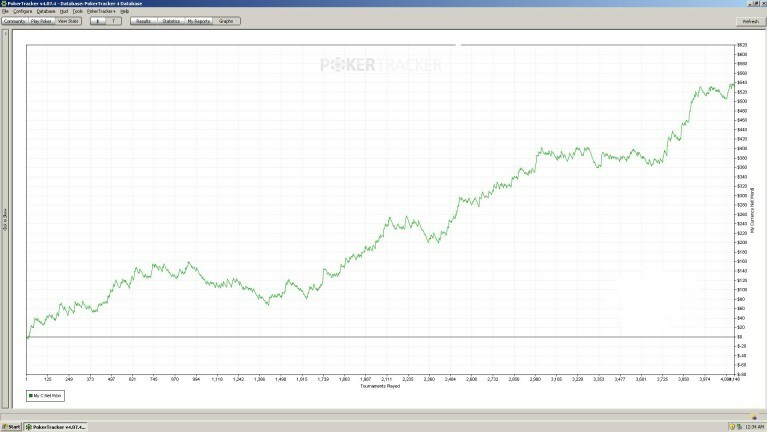 Overall it's much more aggressive, especially late in sngs/mtts when aggression is key to pick up the big blinds/antes. In addition to that I spent a month and a half using Balu's Log Analyzer to perfect every single line of code that was losing in the long run. That alone led to a lot of micro changes. 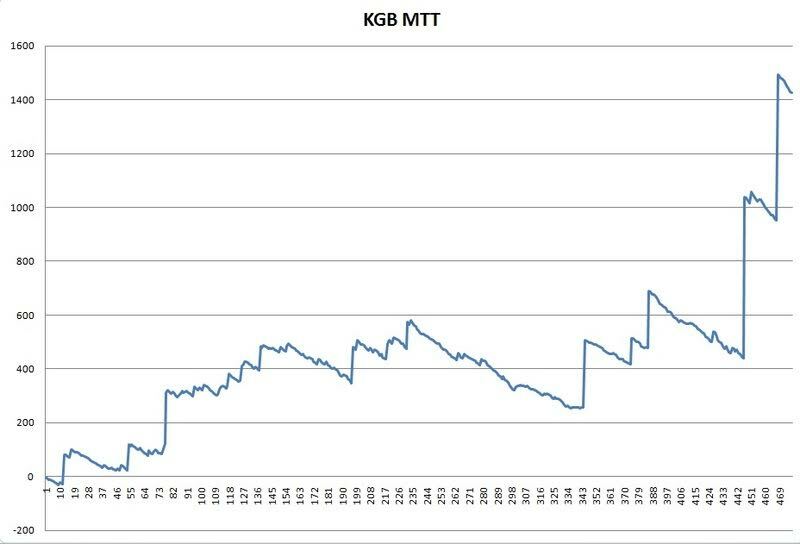 KGB Profile: Proven Winners: Royal Tested - ROI: 40.8%, ITM: 19.6% over 400+ tournaments!!! Thanks! I have put in a ridiculous amount of hours into this baby over the past few months. I am excited to see what people are going to do with it. Its "Rounders". If anyone here hasn't watched it you need to download it immediately! would be intrested to see how this does in bodog's $10-$13 guarantees! 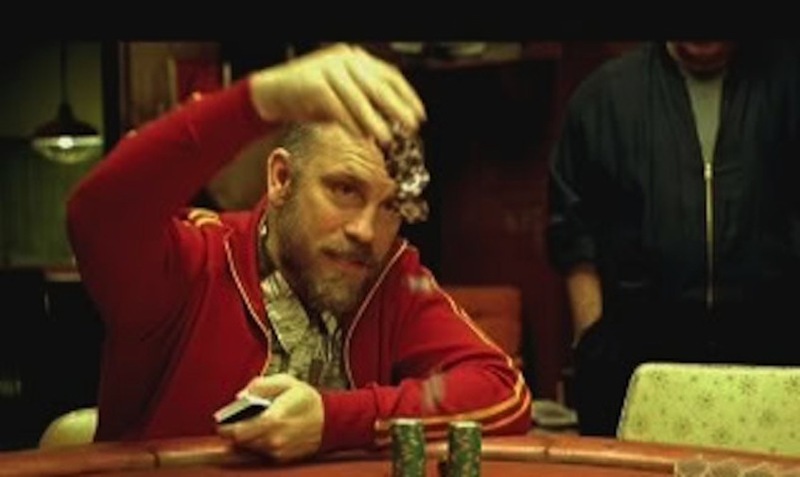 Rounders: yes, a must see. Pay theat man his maney. - what type of sngmtt 180m , 90m or 45m. 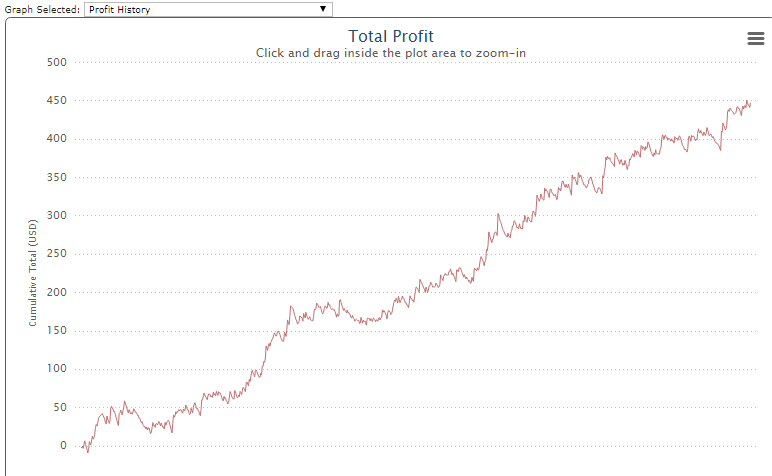 - How to play 1000 mtt in month? - suited for all rooms? - Any statistics about finishing positions. "I had the NutFlush, just the wrong color"
I think I might buy it! Webber...verified? I am currently doing a rags to riches myself and I am up to $7 from free rolls! +1 to most of these questions, also you played normal freeze-outs or rebuys? also is there any chance of a separate graph for sngmtt's and mtt's like from your jackal sales? i understand its an all-in one profile but would be nice to see still. Dream of a perfect bot! I'd be interested in seeing its playing stats from tracker: VPIP, PFR, CC, limp%, Agg.Fx.,3Bet, Fold to 3Bet etc. The money graphs are only relevant for that buyin level, but tracker stats are relevant for all levels. 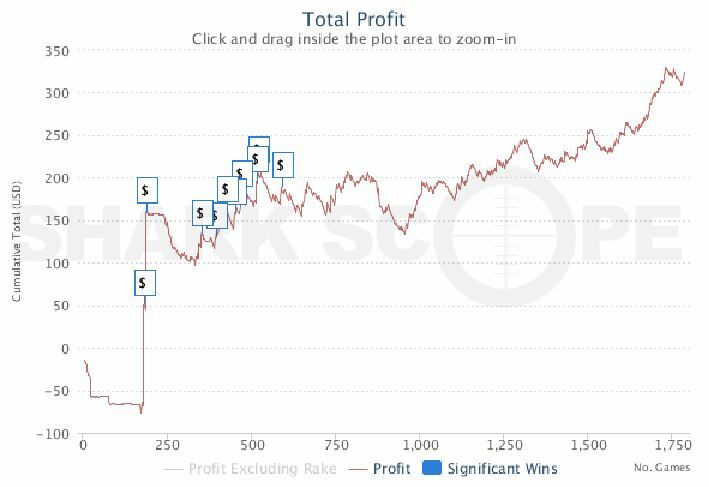 Some key features of this profile are: advanced 3 way / heads up code... in depth C-Bet, bluff, and +cEV Push code... extremely aggressive short handed code... lots of randomization... special "Negreanu" code, etc. Can you please explain further what is this "new poker school" about? After reading this description sounds like nothing concrete (I assume all profiles are this way except may be the randomized and the Negraru part), Cbeting and ICM/Nash are nothing new. So what's the difference between an old school profile like Jackal and this one?. UB has alot of 5000 starting stack tournaments now , is this profile ok to use with them? Because i read that Event horizon should not be used in those. Hey Cosmo Payment sent via Paypal and separate e-mail sent. 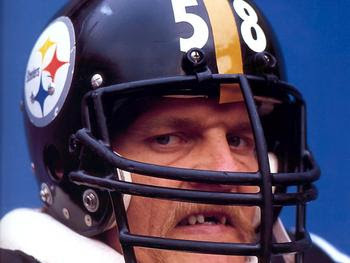 I just added this to the e-mail that is sent out with the profile. Make sure to follow these guidelines. If you are botting on 1 comp. screen, don't play more than 4 at a time. If you are botting on multiple screens, then you can play up to 6 at a time. Just make sure that your comp. can handle it. Check the logs to make sure you are not getting blinded out and use the free bot error checker software that is available in the software section of the forums. I typically get less than 1% errors when I check my logs with that tool. what type of sngmtt 180m , 90m or 45m. I played a variety of games during the testing period. I will keep that information for my customers to help protect the integrity of the games. How to play 1000 mtt in month? I got that volume by using webber's sng starter. You can get 40-60 sngmtts a day using it. Any statistics about finishing positions. Yes, webber verified it before I even posted it.